UNC Asheville is a great place to learn about life, from microscopic cells to organisms to complex ecosystems. 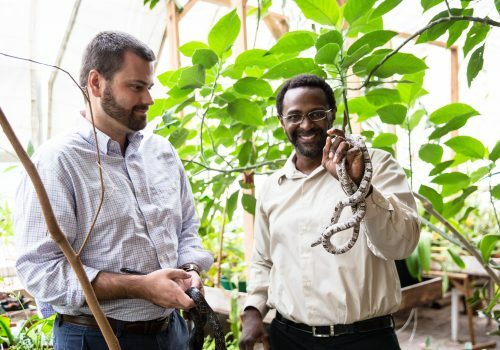 We are a small department with gifted faculty specializing in vertebrate and invertebrate zoology, botany, herpetology, ecology, evolution, animal behavior, human anatomy and physiology, animal and plant physiology, cellular and molecular biology, microbiology, and genetics. Our curriculum for biology majors provides a broad background for students who seek awareness of the living world and their role in it, as well as training preparatory to professional schools, graduate schools, or science education careers. With a robust advising program, we provide students with information on what they must do to qualify for admission to schools of medicine, veterinary medicine, pharmacy, physical therapy, dentistry, optometry, and nursing, as well as Master's and Ph.D. programs in basic and applied research, offering all of the courses that a typical undergraduate should take to gain admission to these programs. While you can spend time working closely with your professors in our state-of-the-art research labs, we also offer ecology courses in the deserts, tropics, or coast. And with over one million acres of national parks and forests within an hour drive of campus, the opportunities for hands-on ecological fieldwork are endless. Studying biology at our liberal arts university also gives you the chance to explore areas of interest outside of biology. From fine literature, drama, and music to technological applications, our students learn that knowledge from all fields relates in some way to the study of and improvement of life. Biology majors can also receive scholarships and conduct research alongside faculty through the North Carolina GlaxoSmithKline Foundation Scholars Program or the UNC Asheville biology scholarship.